It is important to note that when paying for an item or service online that you do so with the individual or firm directly and not pay via a third party, as you could fall foul of a little known, and less understood, loophole in the Consumer Credit Act which holds card issuers jointly liable if a trader breaches the contract. There must be a direct relationship between the customer/client, the card issuer and the offending merchant, otherwise the protection of section 75 of the Consumer Credit Act is lost. Some online companies use specialist payment processing companies like Paypal and Transferwise, and so customers are not necessarily aware of the problem and the implications this means. Action Fraud disclosed that nearly 100 people a week in 2017 were scammed by companies that clone legitimate holiday websites, whereby paying with a card via a third party will invalidate your protection. If this happen to you and your card issuer refuses to compensate you, then do contact the financial ombudsman to handle your complaint. To avoid this use your credit card or debit card and pay the holiday firm directly. Further info on security can be found on our About Us page. I recall the first time I went to the festival of fire some 30 odd years ago and travelled into the city on a motorbike. Not all the way from the UK I hasten to add, but staying with friends outside Valencia was told it was an easy way of getting into the city and fun too. Having not ridden a motorbike since I was a 12 year old (off road), meant having a lesson by a good friend who happens to be a motorbike fan, so a 30 min run around a disused football area and learning to change gears and lean over on the curve was the lesson. I hour later 2 bikes and a pillion friend on the back of my borrow3ed bike certainly concentrated the mind, especially going along the motorway and between cars in city. A very trusting pillion rider I must say at the time. After a great evening out seeing the spectacular displays before they were lit up was most memorable, as well as the return journey the next day for the central square final day of the big bang, whereby at noon an enormous series of hanging bangers are set off building up to a huge crescendo. It was also my first introduction to churros, which are long doughnuts that you can also dip into hot chocolate; fattening, of course, but nonetheless enjoyable. Whatever means you use to get into Valencia, you simply get around on foot. Take the map and comfortable walking shoes. When seeing the displays do pick out the one you want to see burn on the final night, should you return for the burning, that is . 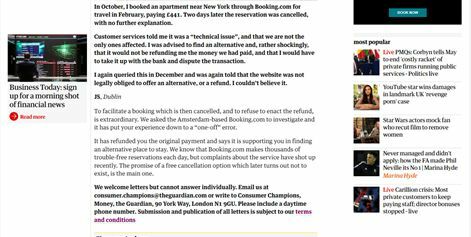 There is nothing worse than having your holiday cancelled, but this can happen even with the biggest holiday booking companies, as shown in the article in the Guardian, below dated 13/01/18. One common problem in this industry is double booking, whereby a holidaymaker books a villa or an apartment or hotel, only to find that it has been cancelled. Ordinarily you should expect a full explanation and alternative accommodation to be given, or a full refund if you prefer it. 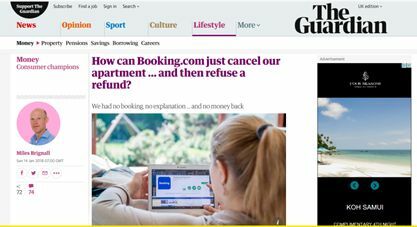 Certainly not what Booking.Com said to their client repeatedly, who was then forced to write in to the Guardian. Apart from our own website listings, you will find us on many portals like Booking.Com, although you will find more information on our website than theirs, as well as more pictures. In order to avoid double bookings the system at villaspain removes the villa from being available as soon as credit card details are given, as well as stops the data feeding to other portals. In the event you were unfortunate to be subject to a cancellation by any operator, which was not necessarily even a double booking error, but because the villa had a major problem preventing it from being habitable, then an explanation should immediately be given as to what has occurred and suitable alternative accommodation can be offered to you. This can be more of a problem if dealing with an individual owner directly, who would not necessarily have access to an alternative suitable quality property. It should be said that cancellation is rare in the case a property becomes uninhabitable. 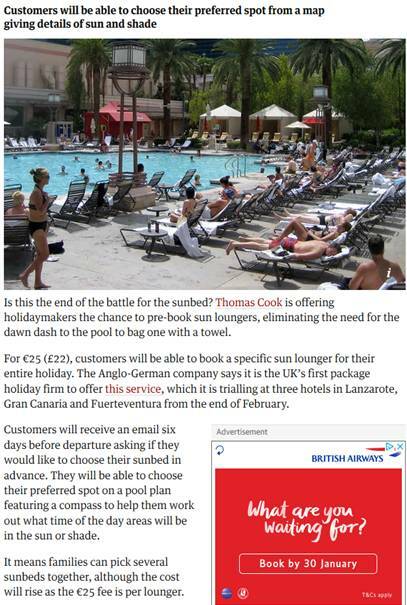 Thomas Cook has reported that the sunbed towel battle could well be at an end in hotels, providing you reserve a sunbed for 25 Euros each. We all know that renting a villa, as opposed to a hotel, avoids the extra costs of a so-called all-inclusive holiday provides, but more importantly it’s having your own private space a villa offers etal that go to make a great holiday. Clearly I am preaching to the converted, as you will have already either considered or have taken a villa holiday in preference to a hotel anyway. However, when travelling further afield and on long haul, then perhaps there is little option but to take a hotel . I was once in Cuba and travelling around the island, whereby a group of 4 of us found it simpler to book hotels for the short stays involved. However, on the final week of our stay we pre-booked a villa through an agent who had arranged our hotel itinerary, and whilst not expecting to much in the way of comfort found none at all. In fact, it was so bad, more like a bunker on a concrete pad with an interior that did not match any picture given, we complained and moved to a hotel. The lesson is here, as we tell all our clients, is to choose a villa giving you as much detail as possible, not just 2-3 pictures and some exotic blurb the agent has written up. 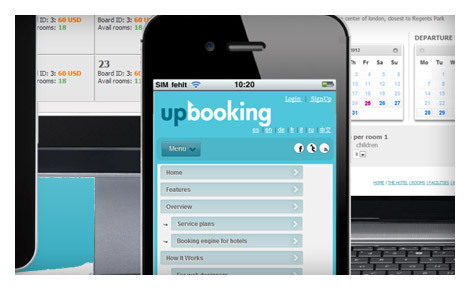 What you should know if using a Booking Portal for accommodation. Whilst it’s very helpful to view listings of numerous accommodation available at hotels and villas within one booking portal, which also allows you to see reviews, ratings and easy to read pricing, it would be wise to dig deeper for more exacting information of what you will really get and the real cost of it. Whether it’s either a short or long holiday planned, it’s worth getting the accommodation right, thus avoiding any disappointment when you arrive to your destination accommodation. Most booking portal listings do not readily reveal the extra charges, unless you dig deeper into the fine print. For example, there may be extra charges for local or national taxes, bed linen, fuel use or even cleaning of the villa itself. If you went direct to the advertiser themselves, then you would find such extra charges more clearly shown on their website, or on their booking form. This applies to refundable damage deposits also. There is limited space on the results page of booking portals, so what you see is a low price and little in the way of extras. The programming is geared to get a conversion as quickly as possible, so you see short notices that refer to ‘only one left’ or 3 people looking at the accommodation or 2 people just booked this’. Do not be fooled into having to make a fast decision and book quickly, but get to the small print of the listing and then copy it, just in case the terms & conditions change or extras are change between your booking and final payment is taken. It has been reported in the media that whilst you see, for example, no cancellation fee is charged on a hotel booking, but then find it was charged when a cancellation was made. 1. Such multi listing booking portals who offer hotel and villa accommodation tend to be listed in the top 3 of Google advertised search results, so it can pay you to look further down the search result page or pages to see what smaller niche firms can offer, whereby you can then view considerably more details and photos. 2. Booking portals tend to charge their hotel or villa client accommodation providers a 15% commission fee, so by doing some research yourself you may well find a Promotional Code that gives you a discount on the very same accommodation, thus saving you money on your booking. Booking direct with the accommodation provider enables you to possibly secure a discount or upgrade, simply as the 15% commission charged does then not have to be expended by the provider. If you simply type in the name of the hotel or villa, with location, which the booking portals show into search bar, you can then locate more readily the same accommodation and book direct with the provider. 3. Some booking portals merely pass your credit card details onto the hotel or villa operator, so it is important to liaise directly with the accommodation provider and ensure you have the reservation number, secured dates, contact details and directions to the accommodation. It is very important to link directly with the provider, not just the booking portal. 4. If you are looking for a longer stay at a villa then you can negotiate a better price than that listed, which is not something you can do with the major booking portals. 5. You would wish to ensure that your accommodation villa is not substituted because of any double booking, so by going direct to the hotel or villa operator you can be sure that this possibility is avoided. 6. Any questions you have about the accommodation are best directed to the accommodation provider, simply as the booking portals do not know the accommodation itself. 7. Do not show your booking form to the hotel, as a hotel receptionist can log into your portal account and leave incorrect reviews. Certainly show the booking reference number. The 200 km Costa Blanca (White Coast) stretches from the town of Denia in the north to Pilar de la Horadada in the south, for which it is considered one of Europe’s most popular areas. Its popularity grew due to its unspoiled beautiful white sand coastline interspersed with rocky coves and pebbled beaches, as well as Spain being very inexpensive in the 1960’s when it first opened up at the end of Franco’s dictatorship era. It can seem, on the face of it, that all has changed, but this only applies to the busy touristy areas of Torrevieja in the south and Benidorm in the northern part of the Costa Blanca. If you enjoy the bustling coastal hot spots with 24 hour entertainment, then you could do no better than staying in the very popular Benidorm. 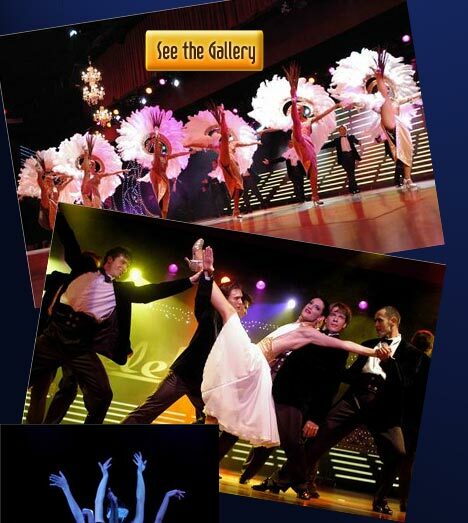 A town that keeps growing with amazing shaped high-rise buildings, with much on offer to entertain the whole family, from water parks to international starred cabaret night clubs. For more information on Benidorm go to our Benidorm page. If, on the other hand, you prefer the more tranquil serenity away from the hurly burly, then staying in the smaller resorts along the coast or just inland can be appealing and is very much a different experience than say Benidorm. 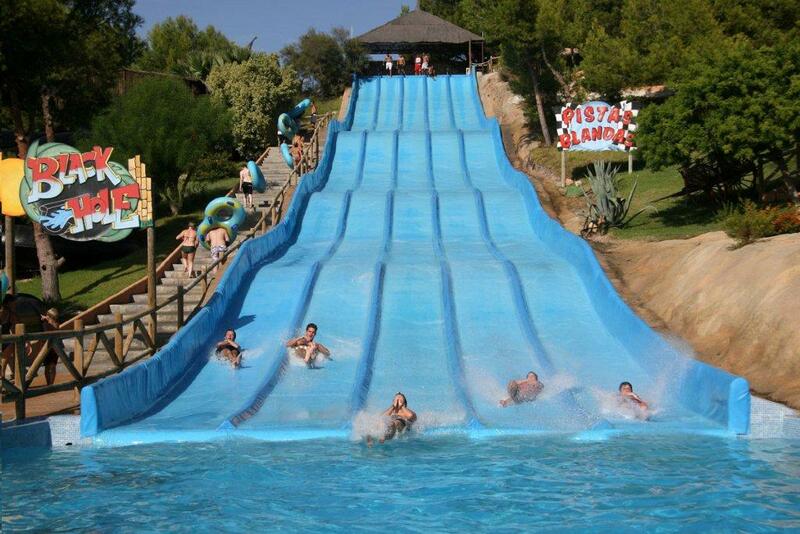 It does not prevent you from taking in a visit to see some attractions in and around the big tourist areas, so if some members of the family wish to go to experience the thrill of say the water theme park in the mountains just behind Benidorm, then it is only a 30 minute drive away from towns like Moraira. With the magnificent backdrop of the Bernia and Montgo mountains you will find quaint Spanish villages, whereby time has stood still for centuries. Prolific vegetation is in contrast to the drier Costa de Almeria to the south. The production of grapes, oranges, lemons, figs, olives and almonds is much in evidence and very inexpensive to buy. 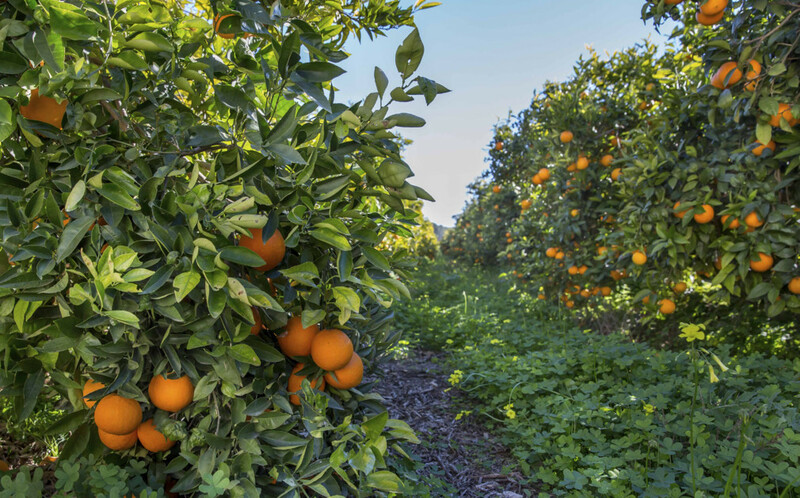 The Late Valencian Orange is probably the sweetest orange of all, and decidedly so in December through to March when they are harvested. Why rent a villa in the Costa Blanca? A villa holiday on the Costa Blanca allows you the flexibility to simply relax by your own swimming pool, as well as discover what is on offer and appealing close by. Superb Climate - the World Health Organization has declared that the Moraira, Javea and Denia peninsula of the Costa Blanca has "one of the most environmentally perfect climates in the world." This micro climate is also appealing in winter too. Warm Sea Temperature - the sea off the Costa Blanca is much warmer than the Costa del Sol, which is cooled by the Atlantic sea. Great coastline - the coastline between Altea and Denia is one of the most dramatic and picturesque in Southern Spain. Great Sailing - Moraira has one of the most beautiful marinas in the Costa Blanca. Discovering some of the inaccessible beaches can be reached by ski bikes or taking a kayak. Easy Communications - The area is served by both Alicante and Valencia airports - either of which is around an hour’s drive to Moraira, Calpe and Javea. The motorway extends all along the Costa Blanca and runs through to Northern Europe - Moraira to Calais is an easy 18 hours drive. 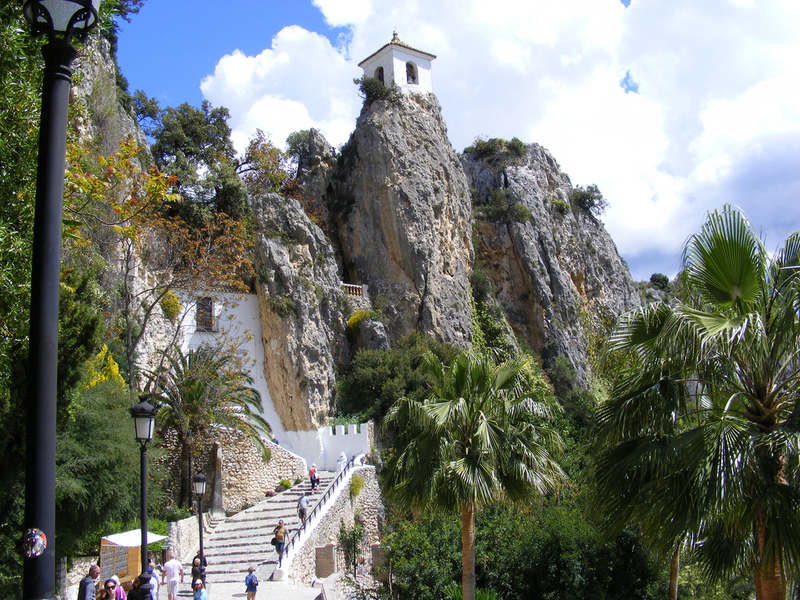 Located on the CV-70 road, 25 km inland from Altea, is the village of Guadalest. Occupying one of the most stunning positions in Spain, this small village is precariously perched on the pinnacle of a granite mountain, giving fabulous views across the valley carved out by the River from which the village takes its name. Getting to Guadalest by the twisting road that climbs ever upwards, passing through the village of Polop, is almost as spectacular as the position of the village, but the breathtaking views make the drive worthwhile even for the more nervous passengers! On reaching Guadalest you can see why the Moors, who constructed fortifications to defend the area, considered this place a site of strategic importance. Some of these fortifications were unconquerable and the remains of several can still be seen today, even though they were bombarded in the 18th century during the Spanish war of Succession. However the building you will see on most of the postcards is the whitewashed bell tower of Penon de la Alcala which seems to cling to the mountain face. Intriguingly the old village and castle is accessed through a tunnel carved from the rock and when you reach the other end and see the ancient houses, you seem to have been transported to another age. Guadalest has plenty of museums, so you can learn more about its history, little crafts shops and places to buy a souvenir of your visit. Costing only a few euros the visit through the tunnel to the village is definitely worthwhile as the castle tour (starting at 10am) takes in the dungeon (great for the kids) and offers fantastic views across the valley from cobbled footpaths and lookout points. The population of only 200 people now dedicates itself entirely to tourism, hence some of the area's best museums being located here. If you want to be transported to another world when land was fiercely defended, don't miss a trip to the village of Guadalest! Also, whilst you are in the area, visit the nearby waterfalls mentioned, below. For more information on guadelest and how to get there go to our Guadalest page. 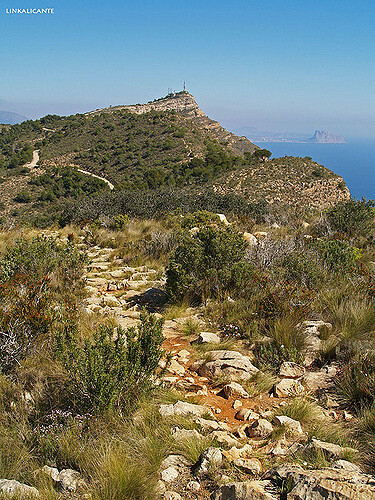 At Callosa d'En Sarrià is situated 30 minutes by car from Teulada - Moraira. The journey there is an experience in itself; Vast plantations of orange trees follow the road on both sides. 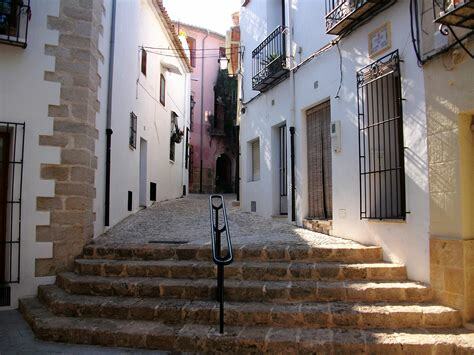 But the special attraction of Callosa d'En Sarria is in the beauty of its Nature Park known as Fonts d'Algar and it was named "Fonts de Fonts" (Fountains of all Fountains). From Callosa the distance to the Fonts de Algar is not very long and it is all well sign posted. When you leave Callosa, you can see the water channels and the exuberant green countryside of the Nature Park on the right side of the valley. 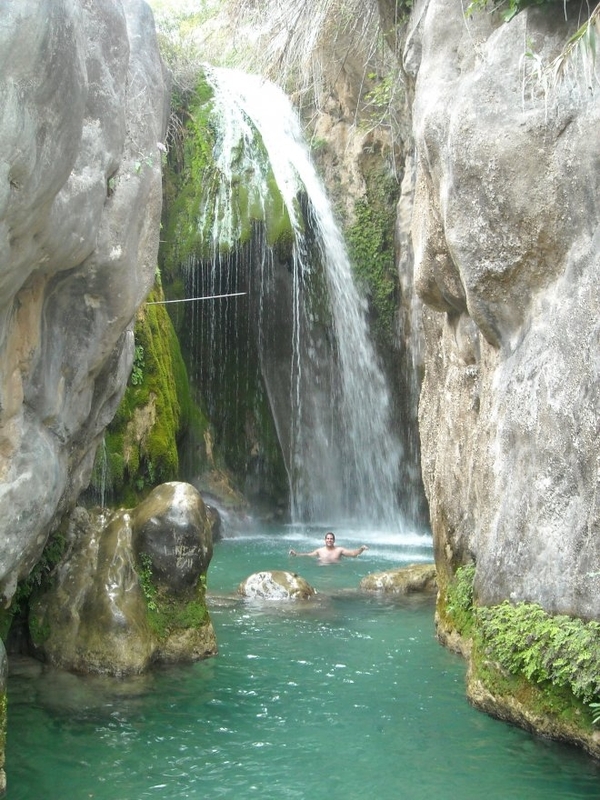 Numerous small fountains that merge into marvelous waterfalls and small lakes, form the Fonts d'Algar. Here you can find many paths to explore the area and see natural pools carved out by the famous waterfalls. In the Summer, visiting the Fountains is a great alternative to a day at the beach, as the water temperature of 18C offers you a refreshing swim and you can always find a shady spot. So don’t forget your swimming costume. Other attractions in the park are the Environment Museum and the tree nurseries, which are watered by the fountains' existing irrigation channels. For more information go to our Callosa page. Elche is the third largest city in the Valencia region in terms of population size and resources. A stroll through the city’s streets will reveal an interesting historical centre, a silent witness to its glorious past. Between the 8th and 9th centuries it was a walled city of Al-Andalus, falling to the Christians in 1265; however, a mere two kilometres south of the present city is its original site, La Alcudia, known as Heliké. It was continuously inhabited from the Neolithic period until the Visigoth period. The primitive settlement developed into the Iberian city of Heliké. The city’s Iberian culture experienced a golden age, producing sculptures such as the Dama d’Elx. The Iberian city was Romanized in 209 BC and in the 1st century BC it was granted the title of Colonia Iulia Ilice Augusta. This glorious past contrasts harmoniously with all of the elements characteristic of a young, dynamic city with a unique townscape due to its location in Europe’s largest palm grove. 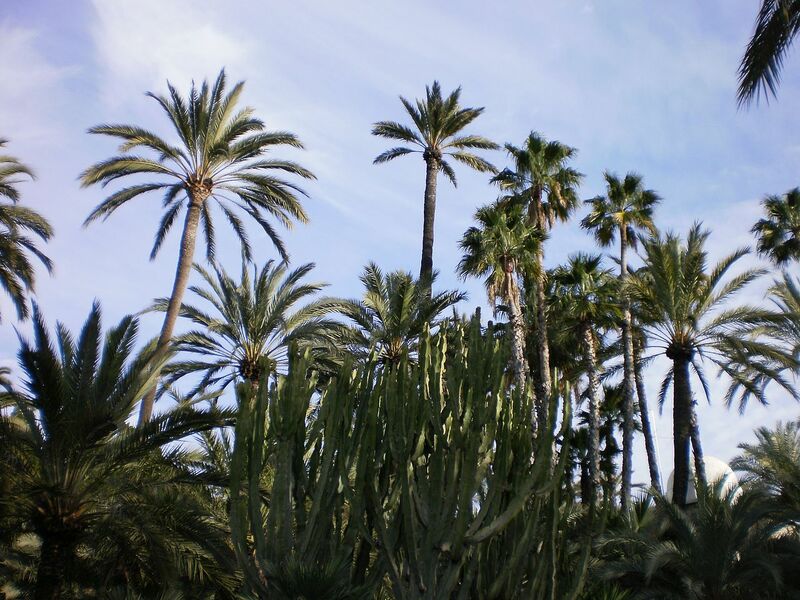 The Palm Grove, legacy of the Andalusí farming culture, has been declared a World Heritage Site by UNESCO. 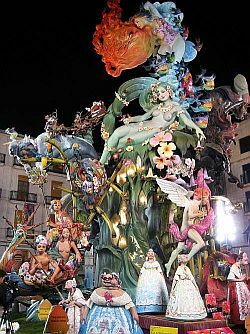 The night of August 13th is one of the celebrations that the townspeople of Elche look forward to most eagerly. Hundreds of fireworks light up the sky in a barrage of colour and sound. For more information go to our Elche page. 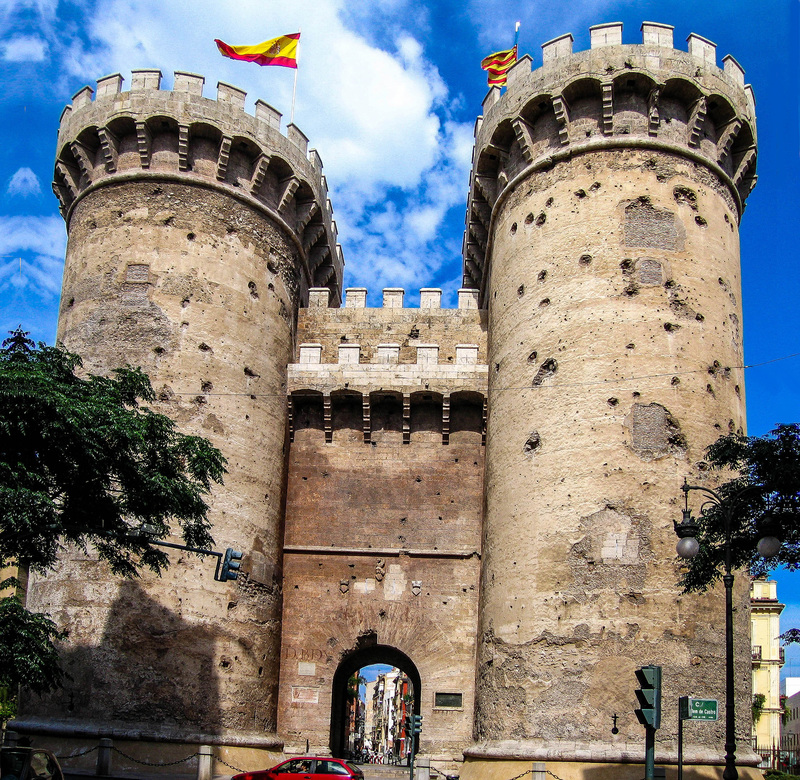 4) Visit the city of Valencia. 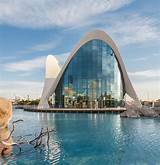 The regional capital city of Valencia is about 1 ½ hours’ drive north from Moraira. Stroll through the old city center, visiting the Lonja, the Central Market, the Cathedral, the Palau de la Generalitar, the Palace of the Marquis of Dos Aguas, the Serranos and the Quart towers. Wander up the Calle Colon where you will find top Spanish fashion brands shops, which are cheaper than in the UK. Continue on to the Mercado Central, Plaza de Mercado, whereby you’ll see an Art Nouveau glass and girder-covered market with over 1,000 stalls, selling everything from live eels and ostrich eggs to vegetables and cheese. Don't leave without sampling the paella. Visit the futuristic City of Arts and Science, Calle Arzobispo Mayoral 14. Forget walking: you have done enough. Pick up a cab and prepare for the jaw-dropping design by Santiago Calatrava. Puncturing the skyline like bleached cathedrals, the complex houses interactive exhibitions, an Imax cinema, galleries, a concert hall, a science museum, oceanographic park and Europe's largest aquarium. For more information on Valencia go to our Valencia page. 5) Get closer to nature. A short drive from Benidorm is the natural park of Serra Gelada (ice mountain) which is a rugged area on the coast that rises more than 300 metres over Benidorm, Alfàs del Pì and Altea. Whilst in the area you may wish to take a beautiful drive up to the Bernia mountain national park plateau, which then allows you to walk around the mountain and even through the natural cave, without having to climb up the mountain. For more information go to our Sierra Bernia page. Not that you necessarily need a car to enjoy the Costa Blanca. 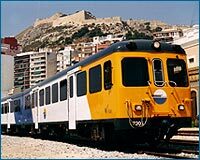 There's a charming narrow gauge railway called the 'Lemon Train' that sways and rattles all the way from Alicante to Denia, with stations at all the main towns, simply a must to experience. It's worthwhile as an experience in itself because it gives a quite different view of the countryside, away from the main roads, and can be quite exciting as it plunges through tunnels and over bridges. But it's also worth taking the train into Alicante for a city away-day - it's an impressive, vibrant city with an attractive waterfront. For more information go to our Lemon Express page.